When making The People's Economics available on Amazon Kindle, I had to choose keywords to describe it. I made a list of possible keywords, put them in rough order and started entering them. When I got to the last slot, Fake Scarcity and Bourgeois were the next two on my list. I searched for these keywords on Amazon. Fake Scarcity didn't bring up anything, so I chose that, as it meant that anyone searching for it would see my book. 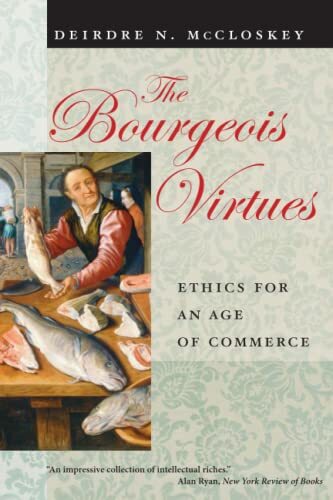 When I search for Bourgeois it brought up The Bourgeois Virtues. One of the things I argue in The People's Economics is that the use of the term Bourgeois in a derogatory way is fundamentally mistaken, which appears to the the premise of The Bourgeois Virtues, so I decided I had to read it. My point of view is that a bourgeois society would be fine if we could reduce the unequal distribution of capital. This book seems to suggest that capital isn't at the centre of bourgeois values. I'll have to see whether it has a convincing argument for this. I was particularly interested in the argument that much of the opposition to the boring Bourgeoisie is the Romantic desire for an exciting life, but that it's this desire that has been responsible for many of the calamities of the last two centuries. I note that the book gives and overview of some of the historical figures involved in the success of capitalism. I found this part interesting and I hope that it goes into more detail later.